We will draw up a plan tailored made for your preferences completely free of charge. We will gladly step by step show you all the options that are available to you! We want to make sure that you are completely happy with the design and we will gladly edit the design until your are 100% happy with the process. For centuries, people have practiced landscaping. As far back as the ancient Mayans, people were manipulating land for both aesthetic and practical reasons. Changing the terrain, additional plants and construction of structures are all part of landscaping. What separates great landscapes from ordinary ones is the creative use of rock or mulch. Landscapers attest that rock is an ideal hardscape material that can be used to bring out the beauty of your plants and add a sense of structure to your planted areas. Unlike wood landscaping, rock requires no maintenance. Better growth: landscaping mulch doubles the rate at which with vegetation or flowers grow. If you need your flowers to grow fast than the normal rate, mulching will help you in a big way. Less water: In bare soil, much water is lost through evaporation. 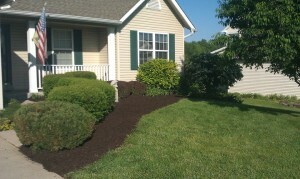 When you apply mulch, you spend less time and money watering the plants, vegetation, or flowers in your garden. Reduces compaction and Erosion: Up to 85%, mulch reduces soil erosion, and people are less likely to walk on mulch thus less soil compaction. More nutrients are deposited in the soil: Once mulch decomposes in the soil, it adds nutrients that plants need to thrive. Decomposed mulch is better than non-organic fertilizers which you apply in your flowers and other vegetation in your garden. Demands periodical replacement: It depends on your mulch type to determine how many times a year you will replace it. Often the exercise is recurring thus costly and time-consuming. Encourages weed growth: Some organic mulch types like pine bark or hay have weed seed in them. If you apply such types of mulch, you will endanger the plant, vegetation, or flowers you are taking care of and eventually affect their growth rate. Low maintenance: Unlike mulch that you have to replace several times in a year, once you have used rocks in a garden you will never need to replace them. Lower cost: Rocks are generally less expensive compared and long lasting to mulch. The only cost you incur as a homeowner is to initial buying price and after that, you incur nothing unless you want to use something else. Fireproof: Fire is a major concern to individuals who live places with wildfires. Rocks serve better such homeowners since rocks are inflammable. Too hot: Some rocks are too hot, especially the lighter ones. They raise the soil temperature hence stressing the thirsty plants. The rocks do not aid plant growth or soil health in whichever way. No good for pruning: Landscapers attest that rocks can prohibit rejuvenation pruning creating thus creating unwieldy shrubs. The flexibility to switch both mulch and rock colors depends on how financially you are loaded. Switching rock colors can be expensive since rocks are expensive to buy compared mulch which at a time you can get it locally. Some colored rocks can be hard to get them locally thus exporting them. Switching color mulch is easier since most of the mulch types can be found locally.